While online dating scams are not common, they do happen from time to time. Everyone who uses an online dating site should be aware of what types of dating site scams are out there and how to avoid them. Occassionally, the site itself may be phony, set up essentially to get money from thier customers. These type of dating scams are probably the easiest to avoid. To begin with, make sure you register only with dating websites and online personals sites that have a solid reputation. Do your research and never ever use a dating website that seems home-made, or that you can’t find any reviews for. 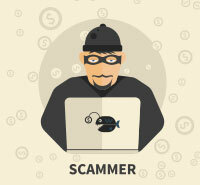 Almost all of the other types of online dating scams involve individual dating scammers. Often, these people pose as missionaries or professionals working overseas, seeking the love of their life. The first sign of this type of dating site scams is a quick, unexpected profession of love. Then, stories will be concocted to induce you to send them money. A member who professes interest, but provides very few concrete details about thier lives and work. Members who have very poor English spelling and grammar. Dating scammers may try to hide this by using text and other types of instant messaging. Photos that look too good to be true. Many scammers fake their photos, stealing photos of models or very attractive people. If they look too good to be true, they may indeed be. Members who are almost always living (or working) overseas and don’t have time to meet you. Some of the more popular countries for this type of scam are Ghana, Nigeria and Russia. E-mails that seem pre-written and don’t respond directly to points in your message. These may actually have decent spelling and grammar. But if you may notice that their e-mails seem very general and impersonal. Any request for you to wire them money so they can come to be with you. The mention of a (fake) emergency story to entice you to send them money for hospital bills, visa bills, or other (imaginary) expenses. A member who insists you provide them with your personal information or passwords to your online accounts. Members who ask you to buy them electronic goods or other items and then send it to them overseas. If any of these sound familiar, you should proceed with a high degree of caution. Generally, there is a very simple way to avoid any of these online dating scams: never send money to other dating site members, never purchase expensive gifts, and never provide them with your personal information until you truly feel comfortable and safe.